Cherry Mobile Flare S6 Premium Unboxing, Quick Review: Best Cherry Mobile Phone You Can’t Have? 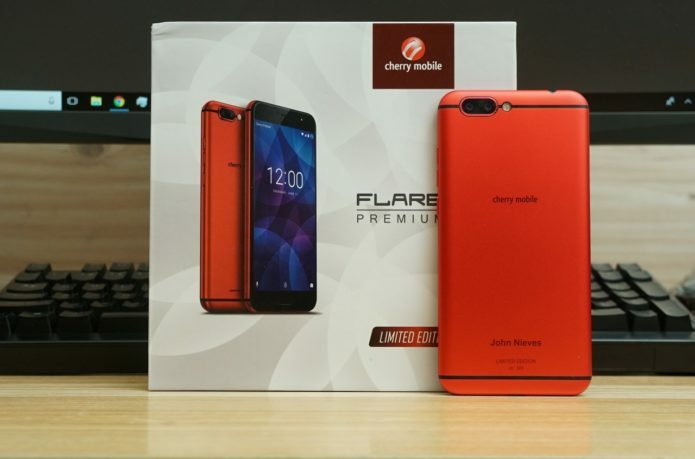 We unbox the Cherry Mobile Flare S6 Premium! After being teased by Cherry Mobile endorser Kim Chiu a few days ago, we finally have our hands on Cherry Mobile’s latest smartphone, the Flare S6 Premium. Just like its name suggests, it’s the most premium member of the company’s Flare S6 lineup but unfortunately you won’t be able to buy this particular phone any time soon. The Flare S6 Premium is a limited-edition device that the company is giving away to partner dealers and members of the press as tokens, but like anything if there’s enough demand in the market they’ll probably cave and offer it in retail. Despite being a limited edition, non-retail phone, the Flare S6 Premium still gets the same packaging treatment as its other brothers. The white box has the Flare S6 Premium has the phone’s photo on the front with the words “Limited Edition”, and its listed specs on the rear. Inside the box you’ll see the USB Type-C cable, charger, included jelly case, headphones and a micro USB to Type-C adapter. The phone sports fast charging via MediaTek’s Pump Express 2.0, though it may only be possible if you use the included USB Type-C cable in the package. The Flare S6 Premium is truly deserving of its name. The phone utilizes a unibody aluminum shell that has a nice, deep red color that’ll probably turn its fair share of heads when you take it out of your pocket. The dual-camera is positioned at the upper left side at the rear of the device, and utilizes a color and monochrome sensor with both being 13-megapixel Sony IMX 258 sensors. On the bottom of the phone’s rear you’ll see the owner’s name, and what number the phone is in the series. Like we said earlier, Cherry Mobile will only be giving out 500 units of the Flare S6 Premium to press, endorsers, partners and dealers. The phone’s physical controls are located on the right of the phone (with the screen towards you) which includes the power button and volume rocker. The 3.5mm jack is on top, while the microSD/SIM tray is on the left side. The USB Type-C port is on the bottom, flanked by two speaker grilles. The phone has a 5.5-inch full HD IPS display, with the fingerprint scanner located right below the panel. The fingerprint button also doubles as a physical home key, and the phone uses on-screen keys for navigation. The front facing camera is a 13-megapixel deal as well. Inside the Flare S6 Premium is MediaTek’s powerful Helio X27 deca-core processor, paired with 4GB of RAM and 64GB of expandable storage. MediaTek’s top-end processor hasn’t made many appearances in phones lately, but don’t be fooled – it’s a powerful chip by itself, and scores pretty highly in our synthetic benchmark tests. The phone is powered by Android Nougat, though it’s free from most of Cherry Mobile’s UI elements or pre-installed software. Additionally, the phone also has a HiFi chip installed inside of it, at least that’s what Cherry Mobile claims. It’s powered by a 3680mAh battery inside, and like we said earlier, has fast charging via MediaTek’s Pump Express 2.0. It’s interesting that Cherry Mobile would commission a phone solely as a limited edition giveaway. The Flare S6 Premium is certainly the best spec’d phone out of Cherry Mobile’s entire lineup, and would probably fall into the mid-range, under 15K category if it was offered for sale. Then again, that’s the price category where many of the international brands are currently fighting at, which puts the phone in an awkward position price-wise if it was offered in the retail space. Still, we’re a little bummed out that the public won’t ever get their hands on the phone. It seems to be decently specc’d, with interesting stuff inside of it that would make it stand out. Hopefully Cherry Mobile will offer it in retail channels in the future, but for now there’s no way for the public to get their hands on the phone.